Employment contracts can be quite complicated and are often drafted in jargon that is difficult to understand. You may have lost your job and need advice from a lawyer as to whether you can sue your employer for damages for breach of contract. A contract of employment is the agreement between you and your employer which sets out the rights, responsibilities and duties of all parties concerned. This agreement begins when the employee accepts a job offer and both parties remain bound by it until it ends (by giving notice for example) or when it is changed by agreement. If no contract is issued to the employee when he first starts work, he is nevertheless entitled to a written statement of his main employment terms within 2 months of starting work. These particulars must be contained within a single document and confirm the names of the parties, the date when employment started, place and hours of work, a job title and description, salary, and details of holidays. This is the minimum requirement but can often mean that important provisions are not accounted for. Naturally, this can lead to further problems if either party disputes aspects of the employment at a later date. For this reason, it is often advisable to have a written and detailed contract of employment, even at the expense of flexibility. The terms of a contract may be expressed or implied. Express terms will be those that are written in the contract, any offer letter, by reference to a staff handbook, or in verbal statements made between the parties. 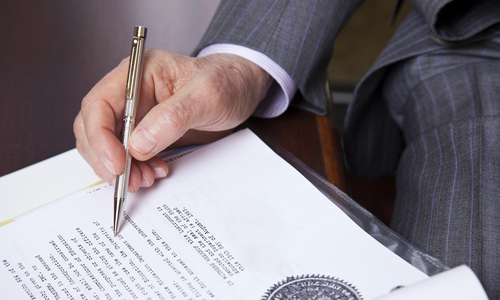 Implied terms are not expressly stated but are assumed to form part of the contract because they are obvious, necessary as a matter of business sense, or incorporated by virtue of custom and practice. Examples might include the obligation of trust and confidence between the parties and where a bonus is awarded every Christmas. When considering your employment contract, you should expect to see certain terms clearly expressed. It should be noted that an employer cannot contract out of certain legislation, such as the Employment Rights Act 1996 or the Equality Act 2010; any clauses which do so will be void. The list below sets out the main terms which are likely to be found in most contracts of employment. Your job title – this is merely one or two words which depict your role, for example, ‘Sales Assistant’. The date on which you are expected to start work – if you have been employed by the same employer prior to your new role, it is important that you check whether you have continuous employment. Your duties and responsibilities – sets out the tasks you will be expected to carry out whilst working for your employer. It is advisable to ensure that you are happy and able to perform these. The general rule is that employers are not obliged to provide you with work but are obliged to pay wages. Place of work – this will normally state the address of the building to which you are expected to report. Sometimes employers will insert a ‘mobility clause’ into this section so that they can require you to work in a different location, possibly another country. If you do not want this, it is important to inform your employer before signing the contract. Hours of work – generally, this section will specify the times of your normal working day, for example, 9am to 5pm. Some contracts will be less precise and may simply state that you must work the necessary hours to complete your tasks. You may also wish to consider if any overtime you work will be paid. It should be pointed out that an employee is not obliged to work over 48hours as an average working week (see Working Time Regulations 1998). However, your contract of employment may insert a clause which states that you agree to opt out of the 48hour maximum. Outside business interests – most employment contracts will state that you are not permitted to hold any other employment. Salary – your annual or monthly salary and how it will be paid, for example, by bank transfer at the end of each month. The law means that your salary is likely to be subject to deductions for tax and national insurance. Mobility – some contracts will provide that the employee can be moved to work in other locations. Bonus – not a standard clause in an employment contract but often included. A bonus is the sum of money that you may be awarded for achieving certain goals at work. Most commonly, bonus payments are discretionary, that is, your employer may decide not to reward you for a given period. In some cases, however, a bonus is fixed and you are entitled to receive it regardless. Benefits – again, you are not entitled to this but many employers will offer extra perks with the job. These might include a company car or mobile phone etc. You may also have the option of taking part in your company’s pension or share schemes. Holiday – employees who work 5 days per week are entitled to the minimum of 28 days holiday per year. The minimum for part-time workers is based on this same level of entitlement pro rata (5.6 days times your usual working week). Bank and public holidays can be included in this minimum amount. You are not entitled to additional holiday, even if it is unpaid, unless your contract specifically makes provision for this. Sick leave – contracts of employment should specify the requirements for notifying your employer of your sickness absence. It should also be stated for how long you will receive your salary and benefits during this period (normally 5 working days in any period of 12 months). Your employer may reserve the right to request that you are medically examined if absent from work for a certain prolonged period. Expenses – if, for example, your job requires you to travel distances or stay overnight, you should check that your employer will pay the any amount you reasonably incur in the performance of these duties. Confidentiality – naturally, most employers will seek to ensure that any trade secrets or confidential information relating to the company that you have obtained in the course of employment is not divulged to third parties. An employer is also likely to provide that anything you produce at work is the property of your employer. Furthermore, it is likely that you will also be prohibited from making any adverse comment about the company. These restrictions are normally deemed to continue after the termination of your employment. Duration of employment – generally, a contract is deemed to run indefinitely and will only be ended by either party giving notice. Fixed-term contracts differ in that they state the event that will terminate the employment, for example, the completion of a certain project or a certain date. Notice – this is the amount of time to be given by each party when they wish to end the contract. As a general rule, the more senior position, the longer the notice period. So, for example, a Managing Director may expect to be given 6 months’ notice. If no notice is specified, the law will imply the statutory minimum of 1 week if you have been employed for one month or more but less than 2 years, 2 weeks if you have been employed for 2 continuous years, and one additional week's notice for each further complete year of continuous employment, up to a maximum of 12 weeks. So, if an employee has worked for 6 years then they are entitled to 6 weeks’ notice. Your contract may state that your employer is entitled to pay you in lieu of notice (PILON) which pays you the salary you would have earned if you had worked your notice period. In this scenario, however, your employment terminates immediately. It is worth checking if your employer will also pay your benefits for this period. Garden leave – this is where your employer can require you not to attend work for a certain period of time. As you are still technically employed, you should continue to receive your salary (and benefits) but would not be permitted to obtain alternative employment. Reasons and grounds for termination – your employer may wish to state what sort of action(s)/inaction(s) will give rise to the termination of your employment, for example, theft or repeated unauthorised absences. Restrictions after termination – as mentioned above, your duty of confidentiality will continue after your employment. Some contracts will also want to ensure that you do not work in a competing business or entice away any clients/employees for a certain period of time. It is important to check that these provisions are not too restrictive. Disciplinary and grievance procedures – it is usual for employers to have separate handbooks which give detailed information on these subjects. Variation clause – it is important to note that employers may seek to include this clause to enable them to vary certain clauses in the contract. Although any variation cannot be too extensive, it is imperative that you check the scope of this clause before signing the contract. Although a contract of employment can seem daunting, these clauses aim to ensure that both parties are secure and well-informed. An extensive contract, although a limiter of flexibility can minimise any potential disagreements at a later date and ensure that you have solid confirmation of the terms agreed. If you are not happy with the contract being offered, inform your employer. A mutually beneficial contract which does not unfairly favour one side is what every employee should expect.